Lending a rustic mood to modern style with its elegantly angled legs, subtle details and minimalist form, this Nightstand will be a unique addition to your modern bedroom. 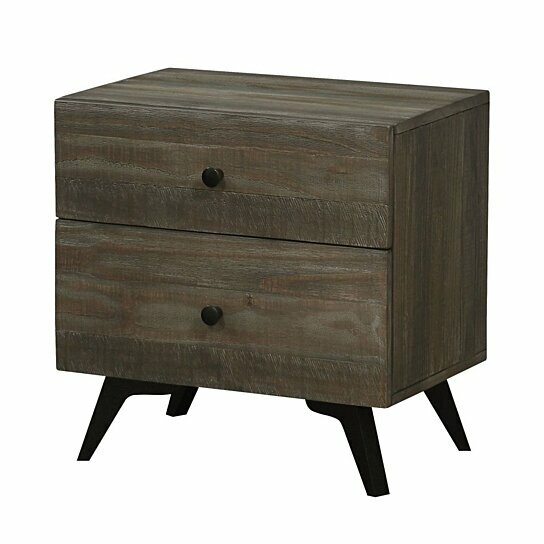 The nightstand is crafted entirely from solid wood and is finished in solid gray pine tone. The alternating sequence of sandblasting, wire brushing, and saw marks on the frame of this nightstand further enhances its look, while simple knob pulls add attraction and bring beauty to your room. Add this nightstand next to your bed and keep all your bedside essentials close at hand with its spacious top and two drawers. The nightstand features two drawers to stow away your bedside essentials. Elegant angled legs supports this nightstand.